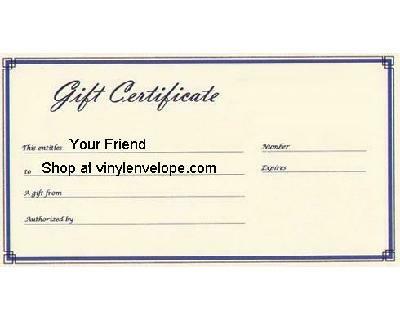 A vinylenvelope.com digital gift certificate makes a perfect gift! Our products are suited for all kinds of people from the entrepreneur to small business owner to the artist, crafter, scrapbooker, professional organizer, or sign maker just to name a few. The digital gift certificate sits in the users account until they use it and never expires! Purchase in increments of the amounts below! Product Name Model # Price+ Unit of Measure Qty Per Unit Qty.